Pilots, please read the NOTAM concerning the Flying Circus Airshow. Owners of Chest or Seat parachute systems who have trouble finding a rigger certified in these types. Anyone looking to make an informed purchase of a pilot/emergency parachute system that will fit their specific requirements. Additionally, there are several pages concerning my personal experiences as a skydiver, and about the Flying Circus Airshow in Bealeton, VA.
Feel free to browse around this site. If you have comments or questions about my site or services, or simply need more information and want to contact me, click on the contact button on any page within this site. 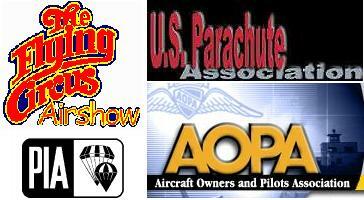 Skydive Coordinator - Flying Circus Airshow, Bealeton VA.